A look inside Trulieve, a medical marijuana cultivation facility located here in Northwest Florida. The parking lot is full outside Trulieve’s corporate office/production facility in Quincy. Surely a welcome sight in Gadsden County, where the poverty rate is nearly 26 percent and the median income is south of $39,000. These vehicles belong to blue-collar workers who grow, package and ship the medical cannabis produced here, as well as highly skilled technicians holding advanced degrees. These are good jobs, and — given the demand for medical cannabis — they’re jobs with a future. “We’re growing, obviously, very, very quickly,” said Kim Rivers, an attorney and entrepreneur who serves as the CEO of Trulieve, which employs about 300 people in Gadsden County. “We received our license in November 2015 and opened this facility in March 2016. We have been growing rapidly ever since,” she said. Trulieve might be the largest employer in the county, with a “spectacular” growth rate, said David Gardner, executive director of the Gadsden County Chamber of Commerce. The county’s traditional tobacco barns are long gone — either collapsed or pulled down after that industry dried up. 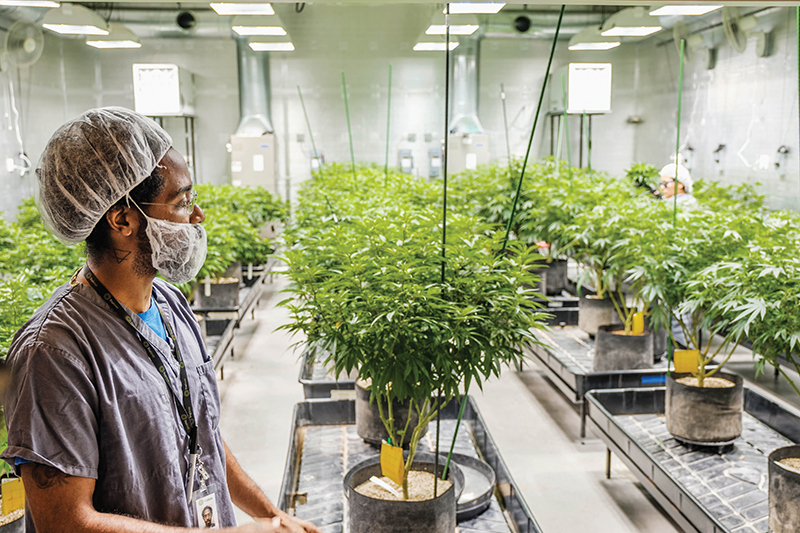 Trulieve represents the next chapter in Gadsden County agriculture — in which the crop matures indoors, in a sprawling, climate-controlled facility. Workers wear scrubs or lab coats, plus paper hair and shoe coverings. A warren of rooms contains plants in various stages of development, from seeds to mature plants loaded with fat buds that drip with aromatic resin. Trulieve employs more than 800 people in 15 dispensaries around the state, plus the headquarters grow house and two similar facilities elsewhere in Quincy. A fourth grow house is planned. The building pointedly lacks signs, sitting behind a tall chain-link fence. Nothing betrays what happens here until a visitor enters and gets hit by a pungent, cannabinoid funk — one that lingers on one’s clothing after leaving the building. Trulieve is a closely held private corporation whose investors include the owners of three North Florida conventional nurseries, including Thad Beshears, whose brother Halsey is a legislator. Florida adopted a vertical production model for medical cannabis — companies produce, transport and vend their wares without middlemen. Distribution through dispensaries and home delivery requires a fleet of more than 40 unmarked vehicles. State regulations call for two staff members per vehicle. Trulieve concentrates on plants with high levels of non-euphoric cannabidol, or CBD — as opposed to THC, the kind that gets you high. The former has been found to prevent seizures. One of the company’s most popular products is Truclear, a concentrated cannabis oil for dosing orally — pop a drop on a cracker or in your stir fry — or via vaping. Its color and consistency resemble honey. The company provides rigorous training to its employees, using a video program plus frequently updated standard operating procedure manuals. Given the rapid growth, there’s ample room for career advancement. Security, obviously, is a priority. The company staggers delivery times and tracks its fleet in real time. Rivers discourages news photographers from taking pictures of the outside of the facility. “At every store, there are security personnel. At the same time, we don’t want patients to feel as if they’re in a security-threat environment,” she said. Doors are key-coded, and cameras keep a look-out. To say the environment is calm and comfortable at Trulieve’s dispensary on Tallahassee’s Capital Circle Southeast would be an understatement. With its blond wood, glass counters and quartz trim, you might mistake it for an Apple Store. Every employee undergoes a criminal background check. Pilferage is not a problem. Trulieve is always on the prowl for workers to sustain its rapid growth. It held a job fair in Tallahassee recently and works with local career resource offices. “One of our stated goals was to try to hire as much as possible from this area,” she said. That commitment played heavily in the state’s decision to award a cannabis cultivation license to Trulieve. “We knew that we could grow in Quincy — meaning expand,” she said. Landrum holds a degree in agricultural economics from UF and a master’s in education and leadership. He previously worked for the Sonny’s barbecue restaurant chain. “I finally am able to use my agricultural degree. It only took 12 years,” he said. Cory Williams, a soil science grad from FAMU and former massage therapist, joined the company in November. “What wakes me up is that I’m directly helping people each day,” Williams said. James Polston, who holds a degree in biomedical sciences and worked in the cannabis industry in Western states, oversees the extraction of cannabinoid compounds from the organic matter. “We have a fairly comprehensive, full-scale analytical set up here,” he said.